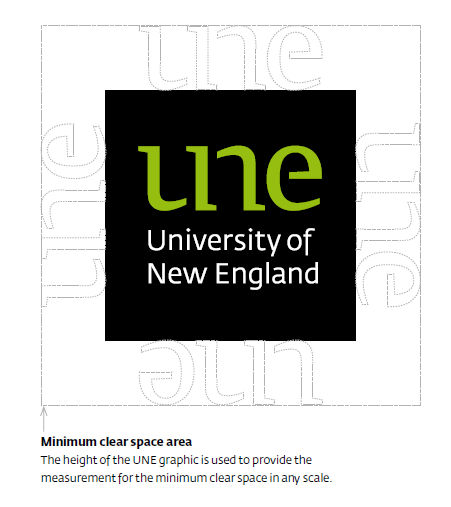 Use of the UNE logo is governed by specific guidelines. 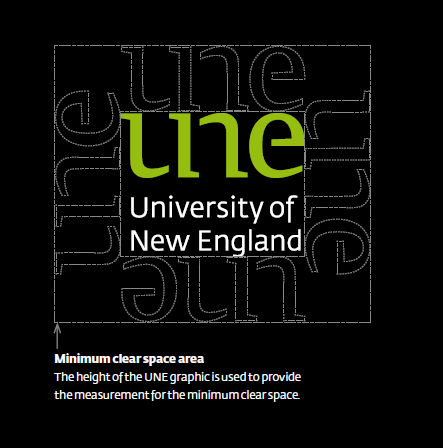 The primary logo consists of the UNE graphic and the words University of New England contained within a square. The logo used in the square provides a visual anchor when used on applications such as brochures, press ads, stationery, signage etc. It also provides a visual resting place for the logo when used amongst other items such as images and text. It should never be redrawn, digitally manipulated or altered and must always be reproduced from a digital master reference. The primary logo uses black and Green Pantone 376 C. Monochromatic and reverse versions of the logo are available for specific requirements. The UNE logo on the website. Whilst the black square housing the logo already provides a clear space for the logo, additional clear space is required beyond the edges of the black square to ensure our logo if differentiated, especially when placed close to text or other logos. Each application of logo use will vary: the rule of thumb must be to always try to provide more than the minimum clear space at all times. Depending on the particular design, some applications may offer the flexibility or requirement for the logo to be applied to a large area of solid continuous black where the square would not be visible. Alternative applications using a continuous background of UNE green (PMS 376) may also be approved using a reverse logo. always try to provide more than the minimum clear space at all times. 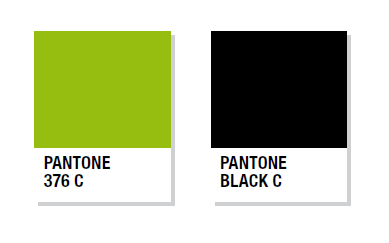 The primary colour palette consists of two core colours, Pantone 376 C and Pantone Black C.
The UNE logo is the primary, core element of the University's visual identity. The UNE logo is part of the website template so, as a rule, the logo will not need to be represented again on a web page. However, if a partnership or collaboration is being represented by a cluster of logos, it may be necessary to include UNE's logo within this logo grouping to represent UNE as part of the collaboration. 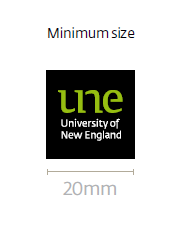 In such a context, the minimum size for UNE logo size is 130 x 130px.